How to turn £5k into £1.5 million! Welcome to my Mid-week Market Update, which will give you insights into wealth management planning, education and tips for trading success. This week’s update is about one of the most important concepts in trading success and also wealth creation in general – Compounding. Simple interest is when interest or a % return is paid only on the original amount you deposit. So let me give you an example Jack puts £5,000 into a trading account and he makes 10% return per month using Simple Interest. 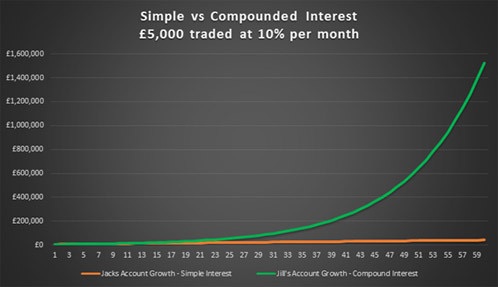 Jack’s wife Jill also puts £5,000 into a trading account at the same time but she makes 10% per month, instead she is using Compound Interest on her account. As you can see above Jack’s monthly earnings will never increase beyond £600 per month. On the other hand, Jill’s earnings will increase rapidly after 3 years and she would be taking home £14,051.22 per month and by year 5 a whopping £138,400.75 per month. As you can see above Jack’s account size after 5 years would only be £41,000 whereas Jill’s account will be £1,522,408.20. 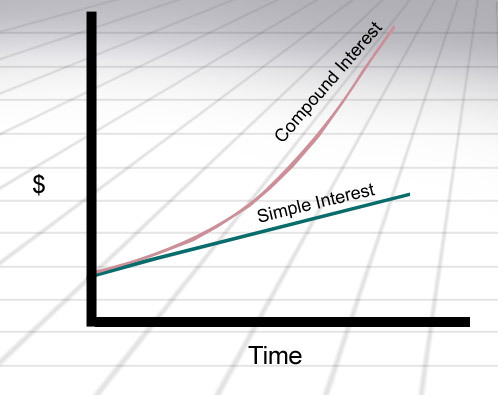 Are you using compounding interest on your investments? How far along this journey are you? When do you plan to start your compounding your money faster? Disclaimer: The presentation content is for educational purposes only. Any targeted returns shown in this email and attachments are not guaranteed and your results may vary depending on your trading ability and market conditions. The value of investments and the income from them may go down as well as up and are not guaranteed. You may lose the entire amount invested. With some leveraged investments such as spread bets and CFDs, your losses may potentially be unlimited.